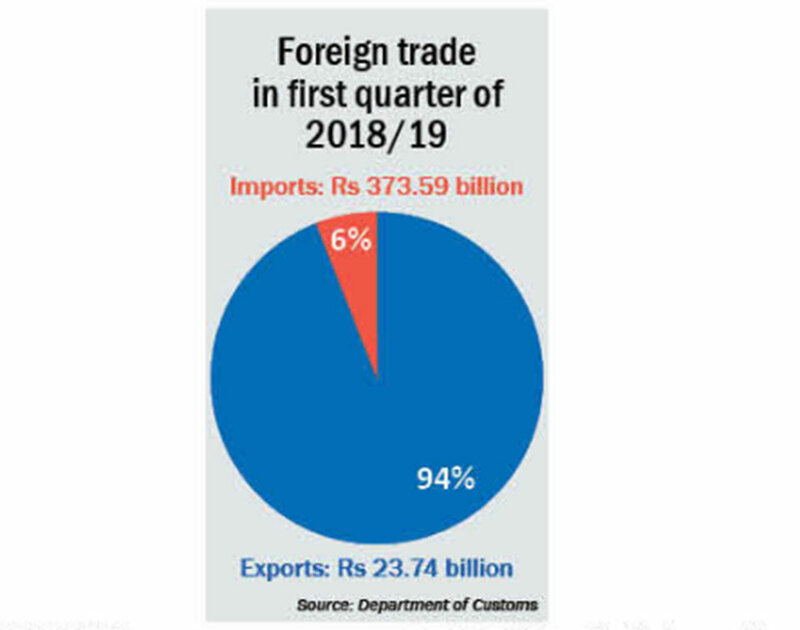 KATHMANDU, Oct 26: The total trade deficit of the country has widened 45.92 percent in the first quarter of the current fiscal year 2018/19 to Rs 349.84 billion, driven by a sharp rise of import bill and sluggish exports growth. According to the Department of Customs, Nepal imported goods and commodities worth Rs 373.59 billion in the first three months of the current fiscal year, up by Rs 113.83 billion compared to the corresponding period of the last fiscal year 2017/18. However, exports have grown nominally compared to the jump in imports. According to the DoC, Nepal exported a total of Rs 23.74 billion during the review period, up by Rs 3.29 billion compared to the same period of the last fiscal year. The skyrocketing import has also increased the export to import ratio to 1:15.7. 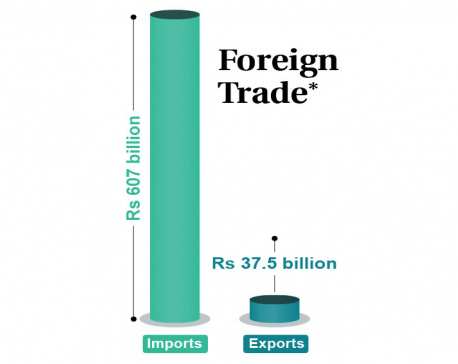 This means the country imported goods worth Rs 15.7 while exporting goods worth one rupee. Top five commodities accounted for nearly half of the import bill. Fuel remained at the top of the list of imports in the first quarter. The country imported fuels worth Rs 56.68 billion while iron and steel remained second top imported goods in the first quarter. During the review period, the import of vehicles stood at Rs 29.49 billion. Similarly, machinery and mechanical appliances (Rs 28.6 billion) and electric machinery and equipment (Rs 21.94 billion) were two other top imported items in the review period. On the other hand, man-made staple fibers were the top exported products from Nepal. The country exported the fibers worth Rs 2.38 billion in the first quarter. Carpet (Rs 2.35 billion), coffee and tea (Rs 2.24 billion), apparel and clothing accessories (Rs 1.91 billion) and iron and steel (Rs 1.6 billion) were other four top exported products from Nepal, according to the department. However, Toyam Raya, director general at the DoC, told Republica that the appreciation of the value of the US dollar has contributed to the rise in the import bill. “The value of US dollar has gone up by nearly 15 percent in the last few months. The stronger dollar along with rising inflation has contributed to the growth of import,” he said. Raya also attributed the rise in the import bill to the government's crackdown on the practice of under-invoicing of import items. “We have taken some efforts to curb under-invoicing of imports. This has also increased the value of some imported items,” he added. However, Raya said that imports in terms of quantity have gone up by nearly 15 percent, which is the average annual growth rate of last 10 years.